Fun and flirty, fancy and feminine, my new vintage 40’s dress is made using Simplicity’s new Fall 2013 pattern release (#1587), and it turned out to be wonderful in all its satin beauty. 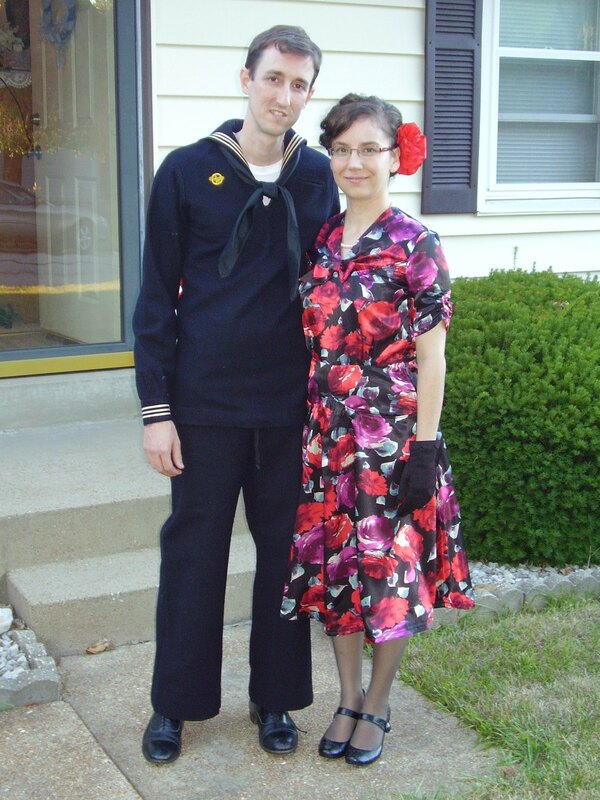 I had the perfect reason to get to making this dress sooner than later, for hubby and I had a 40’s dance to attend. I (well, both of us) received many compliments on our outfits. I could proudly say, “Thanks, I made my dress myself!” Thank you Simplicity for another great vintage pattern! Aren’t we cute together? The hangar dance was held at the historic St. Charles County Smartt Airfield, which began seeing use in January 1941 as a Navy student pilot base for WWII. This was the perfect opportunity for hubby to wear a Navy uniform from my dad’s stash of historic clothes. My dress was specifically made to be a complimenting contrast to my husband’s Navy uniform while sticking as close as possible to the pattern envelope. NOTIONS: I always have interfacing and black thread on hand, so the only notion I needed to buy was the side zipper, 1/4 inch black elastic, some extra bias tape and some hem tape. The button I used for the back closure is a vintage oldie, coming from my family’s stash, and is a pretty, frosted, clear ball type. TIME TO COMPLETE: It took me 22 to 25 hours of sewing time, spread out over 5 days, with a few added hours for cutting, to complete my satin 40’s dress. I finished it on September 20, 2013. THE INSIDES: All the seams are finished in black bias binding, and the hem is covered with hem tape. The armhole sleeves are the only “unfinished” part (with a zig zag edge finish) on account of the small 3/8 in. seam and not wanting to restrict the satin’s give. It’s a shame how the finished dress hides all the cool details, and time consuming work put into doing such fine points. 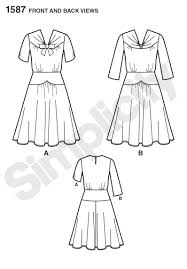 The envelope’s line drawing, however, offers some easy clarity: this 40’s dress has a front bodice with pleated (gathered) yoke, a bow at the neckline or just a decorated loop, a back button and loop closure, a wide skirt yoke that comes to an inverted point, gathers on the sleeves and also at the skirt center. According to the “finished garment” measurements, the ease did not seem too overly generous, but, just to make sure this dress wasn’t going to be as loose as my “Lake Girl” 40’s blouse, I did some graduated sizing for every different area (similar to the sizing for my 1936 Puff-sleeve blouse). My Simplicity 1587 dress has a size 8 bodice front, size 10 bodice back, the skirt yokes graduate from a 10 to a 12, the skirt is a 12, and the sleeves are 10. 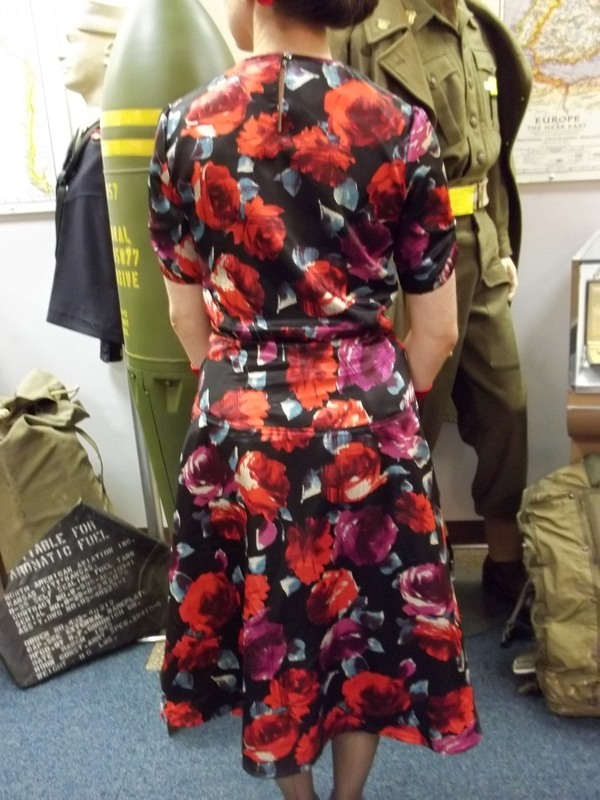 Altogether, I think my satin 40’s dress fits well, but even doing my right sizes, the skirt yokes turned out quite snug (but it’s probably supposed to…it would look funny baggy). The finished sleeves were also snug and a bit confining across the front and back of the bodice (not at the top shoulder seam), but I took out the 5/8 seam and re-sewed a smaller 3/8 inch seam to make a satisfying fix. For someone who often needs sleeve room, a large upper arm adjustment might be a good idea to do to the sleeve pattern piece. 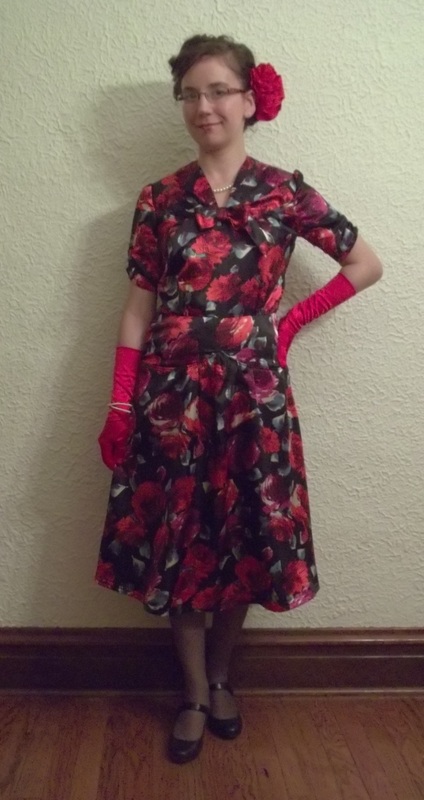 There were several tricky points to making this Simplicity 40’s dress, and the instruction sheets did not really help that well nor clear up some confusion, so I will list them here to help sewing this dress easier for anyone else. 1.) The front bodice yoke (neckline) gathers are actually pleats. I found out the hard way by trial and error that there is only one way to sew the neckline pleats as instructed: you have to start with the bottom pleat closest to the center front and work up. The middle pleat gets its bottom corner folded over to form the pleat next to the center front seam, so, for this to work, you have to sew in this direction. I wish the instructions had clarified this point. I did hand stitch the facings down to the lining, but, just a word of warning, it doesn’t really work if you tack the front facings down any more than an inch or two below the shoulder seams. The neckline pleats need freedom. 2.) The pattern piece for the back closure loop really could have been made longer lengthwise. I made mine according to the pattern (no changes). It was SO small it was hard to sew and work with, also too small as a loop once it is sewn in to the dress. Loops that are too small make it hard to close on yourself behind your neck, and even harder to find a good button to match or fit. 3.) The yoke sections for both the skirt and the bodice were a sort of fine work to get finished nicely, but there was a better way that the instructions could have mentioned. For example, the front skirt yoke comes up into an inverted V over the stomach and the skirt gets gathered in under that V. Now, deep curves like that can be tricky, not to mention adding the gathers and a sharp corner to the equation. My gut told me I should ditch the instructions…I would have had an easier time had I listened. I am convinced, the absolute best way to do the front yoke /skirt inverted V section is to do a lapped seam method. Any other way is just frustration, believe me! I did succeed in doing those tricky spot quite well (unintentional bragging). Ironing and lightly steaming my satin down helped immensely towards making the yokes and gathers look good, lie flat, and not pouf out. 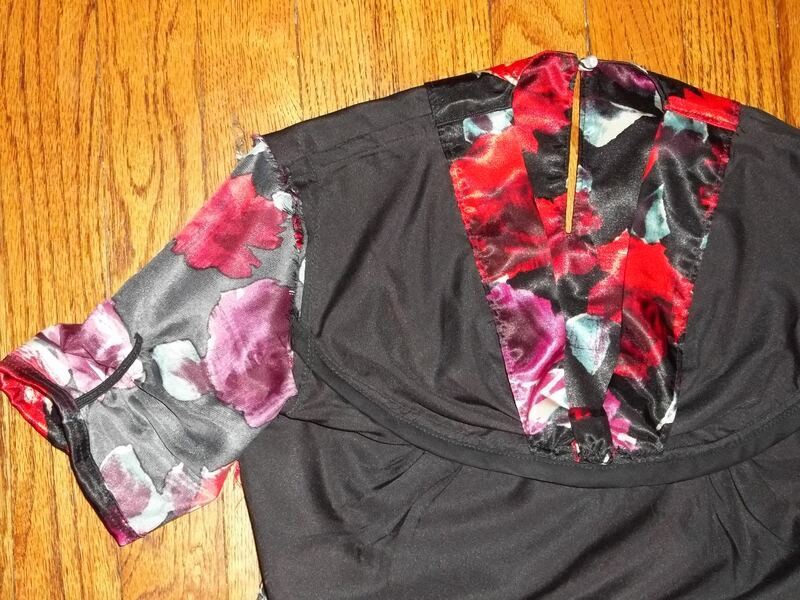 This satin 40’s dress has some details (see picture above) that are firsts for both my wardrobe and my sewing skills. Sewing in a small piece of elastic while stretching it out onto the sleeves was fun to do and makes a very cute and unusual detail. I love it – but not as much as I love the bow neck front. The bow at the neckline was the very last thing I added to my finished dress because, at first, I wasn’t sure if I would like it. However, I think the bow really makes this dress, and puts it together nicely. Plus…it’s just plain fun! Even if the rest of my recommendations for sewing up this dress are disregarded, the best single piece of advice I will say is to please do all the markings as the pattern directs, and your version of Simplicity 1587 will go together fine. 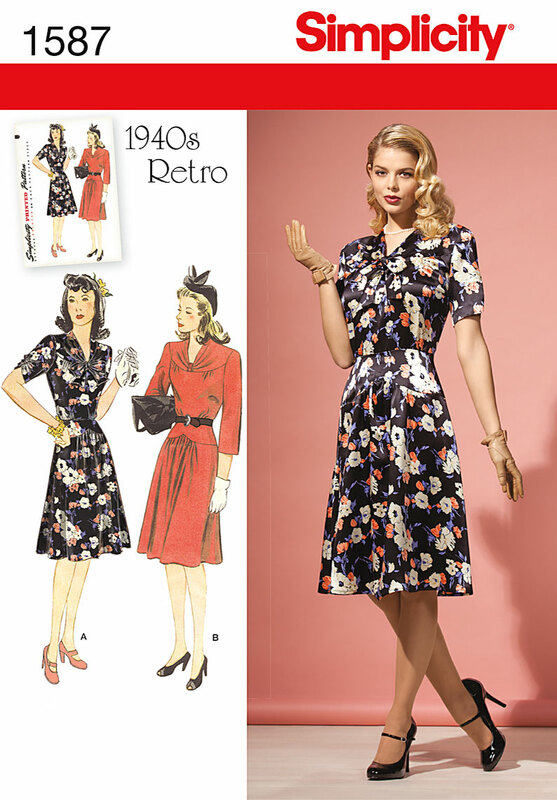 This vintage pattern reprint might be a little tricky in some parts and take a bit extra time, but it is seriously worth it in the end – believe me! 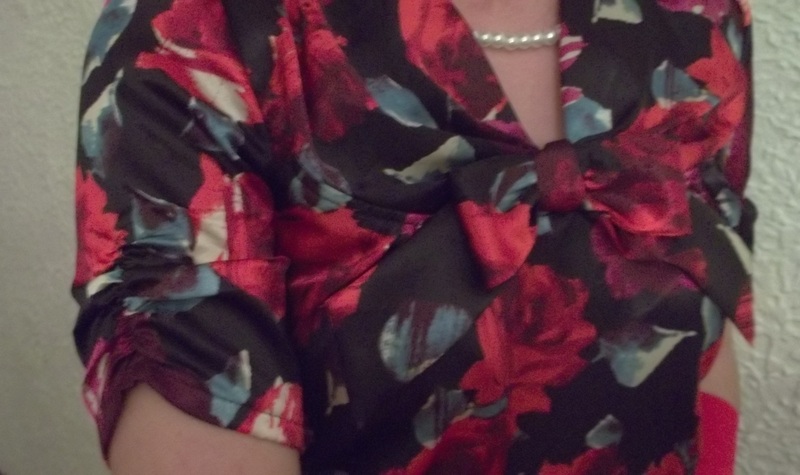 As dressy as my 40’s bow-neck dress looks, it is very comfy. The skirt has some great swing in it for dancing, too. The dance we attended was held in the hangar which houses two old planes (a B-25 Mitchell and a TBM Avenger) so it was dark in there and I ended up accessorizing my dress with the longer length, shiny red gloves you see in the picture at right. I wish I would have remembered to get it in a picture, but I even used a makeup pencil to draw a faux stocking line up the back of my legs. Yeah, I went pretty authentic that night. 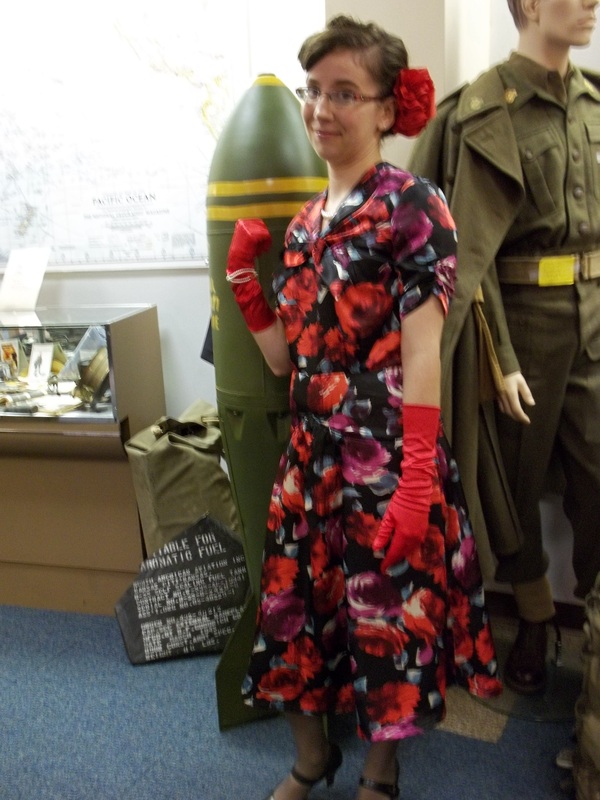 This last picture was taken in the Smartt airport museum. It is added just for the fun of it…I hope it gets a laugh. This dress is da bomb! Visit my Flickr ‘Seam Racer’ page for more pictures (especially a view of my hair-do – a half “toilet bowl” style).